Church is a great piece and evokes interesting conversation for art lovers and students of the Word. The background color is a blend of purple and white that create different fusions of lavender. There is a poignant message herein. Do you know anybody like this. They are in the church; but the church is not in them. Or another way to put it is: they are behind the glass windows; but they left their hearts outside. Notice that the word church is on the outside the window. Power lessons and bible study lessons flow from the work; from the colors to the words therein. According to the Rainbow Bible, yellow represents family or genealogies. Red represents the blood. Blue is for salvation. Green is for growth. Orange is for blessed. Let the conversations begin; and the anointing flow from the space. This piece can be displayed at your church or in your home. mouse pad $25.00; matted print $100.00, custom framed and matted print $300.00. Hearts is one of my favorite pieces of PoeArt. This pieces is displayed in an 18 X 34 custom frame and has resided in several rooms in my home. I love all kinds of art–visuals, poetry, mixed media, etc. I tend to lean toward impressionist art. I have some oriental and French motifs–eclectic environment. Fanshue, ambiance, character, or however you describe the mood of your room, PoeArt brings the anointing as well. Mouse Pad $25.00 for size 8 1/2 x 11, matted print $100.00, (matted up to 18 x 34) custom framed and matted print $ 300.00. 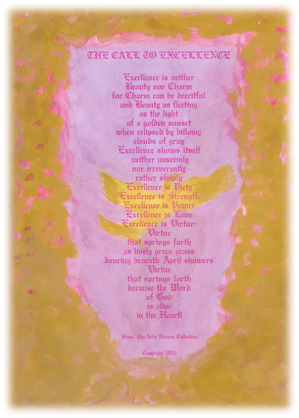 This lovely expression of excellence is written in the midst of shades of saffron, fuchsia, lavender, and plum. The original is a fusion of water color on art paper. The choice of frame in the photo is mahogany with antiqued corners. The anointed writing appears to be reflected in a shield. This was not intentional on the artist’s part. However, it gives rise to the heart of the message that: “Excellence should be a shield of honor.” In the center, is an eagle–the ultimate symbol of strength and power? God will give us the strength and power to soar above all of our challenges and defeats. Look how it compliments a room. Let us make you a mouse pad for $25.00 or send you a matted print for $100.00, or a custom framed and matted print for $250.00.